Notice: No further passenger service is offered on any Hanjin route. 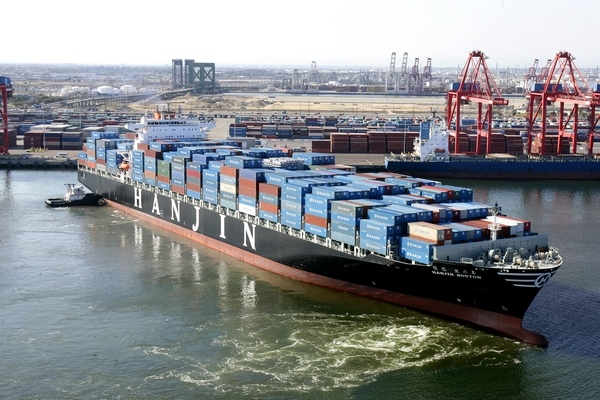 NSB Freighter Cruises have once again introduced cargo-passenger service on the Hanjin Lines service between Italy, the Far East and California, with a full round voyage of 112 days. La Spezia to Long Beach is 54 days and Piraeus to Long Beach is 42 days, while Oakland to Piraeus is 50 days and Oakland to La Spezia is 53 days. Other routes are also available, e.g. Trans-Pacific or Europe-Far East. This reinstates direct connections between Europe and the US West Coast. The 92,984-ton Hanjin Boston carries a maximum of ten passengers in two Owners, two Double and two Single cabins, and each ship is equipped with an indoor swimming pool. Rotation is La Spezia – Genoa (day 2) – Barcelona (day 5) – Valencia (day 7) – Piraeus (day 12) – Suez Canal (day 15) – Singapore (day 30) – Baria Vung Tau (day 32) – Hong Kong (day 36) – Shanghai (day 39) – Pusan (day 42) – Long Beach (day 54) – Oakland (day 59) – Pusan (day 79) – Qingdao (day 82) – Shanghai-Yangshan (day 84) – Ningbo (day 85) – Hong Kong (day 88) – Yantian (day 89) – Nansha (day 90) – Singapore (day 94) – Suez – Piraeus (day 109) – La Spezia (day 112). Fares are €95 per person per day in the Owners (€110 per day for sole use) or €85 to 90 per person per day in the Double cabin (€100-105 per day for sole use) and €85 per day for the Single cabin. Port taxes and deviation insurance are extra at €85 and €160, respectively). For details on other routes please call Miri Lopusna at The Cruise People Ltd in London on 020 7723 2450 or e-mail cruise@cruisepeople.co.uk.